The different between Lux and girls is ability to grow remarkably and Lux's strong point is his radical growth in short time. He only took a half year to win against Singlen. Yoruka's skill might be equal with Lux when she fought him in volume 5 but now, i don't think we can say they are equal. She can still use all of the hidden Drag-Ride control techniques that he created. And she can mess with people's perception using the power she got from Baptism. @XFire: He did beat her, but like I said he almost lost. @Mirable: You got me there. Good point. But she didn't. She lost. He won. That makes him the better fighter. Almost beating someone does not somehow make you stronger than them. In his fight against single it was a draw but single got back up so technically lux didn't really win and in his fight with Yoruka remember lisha saved lux when yoruka had him and Lux was able to win because he explored her emotions which she wasn't supposed to have. lux is a badass don't get me wrong but hes not op. Also your mixed up aeril can change people's perception yoruka can read peoples consciousness. @Sierra: I guess you're right. Given Lux's rapid growth, he should be able to beat her more easily now. @Choreprince: Yeah, my bad. I got Aeril's power mixed up with Yoruka's. Speaking of that, though, I wonder if Lux has any power from Baptism. He did get one applied 2 or 3 times. Isn't that just the main, desired effect of Baptism (making the body stronger)? Yeah, but all Lux seems to have gotten from it is a stronger body that lets him operate Bahamut for longer. Which seems to be "mundane" or too tame compared to what the others got. Yes, but that's only if you factor in Bahamut. Aeril and the others' Baptism doesn't require Drag-Rides to seem amazing. If only Lux's Baptism gave him some kind of harem related power, like using the Divine Raiments of his harem. That would even the odds against Fugil a bit. Going back to the cover illustrations, we now know who will be on the covers of volumes 16-18: Lisha and Krulcifer, Celis and Philuffy, Yoruka and someone else (Airi? Aeril?). But if the New Kingdom arc will be 5 volumes long, that still leaves 2. I'm thinking that Volume 19 might have Fugil with Arshalia/Sacred Eclipse, and Volume 20 might have all of the main cast. 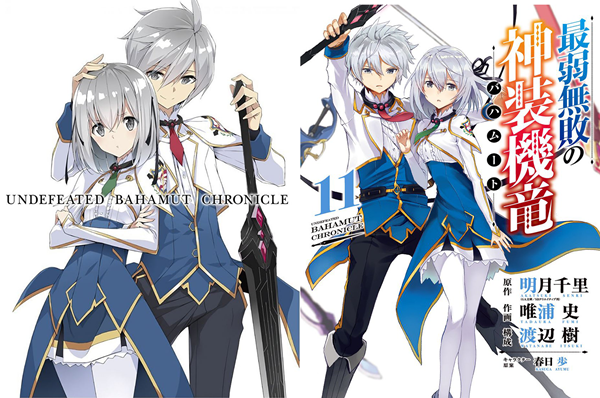 ^nah i'm sure last volume will be Lux & Airi on cover, Just like cover of anime and manga last volume. If that ends up being true, then we know one person on this thread that will be very excited . Hoping Airi gets a full arc, surely she is deserving of one. Someone needs to get her into a control room and train her to be a commander. She obviously has the talent and she can see the battle much better than anyone who is in the middle of the fight. Lux and Airi together but no collar on their neck. To be honest I think the final volume cover would be all the girls with Lux and without the freaking criminal collar, finally!.